Visionboat is a one-man firm which designs and builds boats and creates unique solutions for boats in general. The vision is to help create fast and eco-friendly sailing boats. I am interested in using and developing the latest knowledge and alternative materials to create the best products. Among other things, Visionboat has developed a completely new method for molding carbon fiber masts so they have a high strength, great finish, and an efficient production method. I have sailed many different kinds of sailing boats – both touring and racing. I have also done some long-distance sailing: a trip across the Atlantic and back and a trip from New Zealand to the Mediterranean. 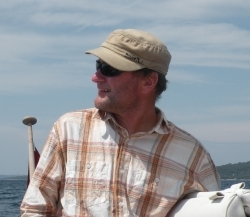 I have used my experience as a boat builder and as a sailor, both in Scandinavia and the Oceans, to design my boats. My great interest and passion for multihull-boats have made trimarans my specialty. In particular, my two trimarans Barracuda and Black marlin that I have designed and built, has given me the knowledge and experience that I have developed and use in other types of tasks. I am a qualified boat builder from the Ring Andersen Træskibsværft and have also been many other places since, include the known Walsted Bådeværft.